I live about 7 miles from Dundee. This means I also live about 7 miles from my nearest Starbucks. I have loved Starbucks since I first visited a US store some *cough* 20 years ago. The woman at the till greeted the guy I was with by name, and gave him his coffee for free. I was in awe. You may have noticed, the UK is not great for customer service. This was an entirely new experience for me. Since then I have visited Starbucks all over the world and received the same level of friendly customer service in every store. Then I read the book by the founder of Starbucks, Howard Schultz. Pour your heart into it is a book about building a brand and having the vision and passion to stick to your brand ideas. It warmed me to Starbucks even more. 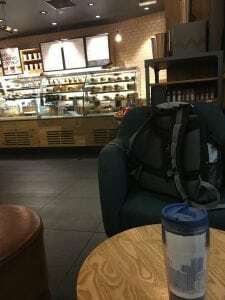 It has become a bit of a thing of mine, a trip to Starbucks. I have visited them all over the world from the US, to Germany, to Egypt. The coffee is always the same, but the food is very different. In the US they have what I call an “eat it all day cake”. It’s kind of an apple crumble tray bake thing but it’s really dense. It pretty much takes me all day to eat it. As I like my milk coffee flavoured (a latte), then Starbucks is perfect for me. I can’t stand Cafe Nero. The coffee is too strong and bitter. 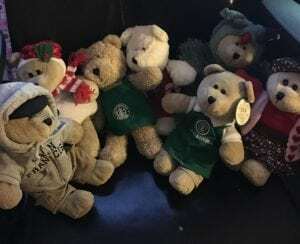 Costa and McDonalds coffee are ok.
Starbucks used to do soft toy bears. I collected them. But then Howard Schultz stepped back into the CEO role after a decline in sales and insisted that they just make coffee, not sell toys and CDs. And so no more bears. Which is a shame because they are cute! Anyway, one of the things I love most about my 9-11 lectures at Uni is coming in early (to get parking) and then walking into town to start my day with a Starbucks. Unlike the other coffee places that don’t open until 8am, Starbucks opens from 7:45. I wander in and usually get my favourite seat by the window. I hand over my cup (currently my San Francisco Starbucks cup) and they know me well enough to know what I want. They don’t need to ask my name, they all know it there anyway. We chat about the day ahead and then I take a seat, sip my coffee and play on my phone. If it’s a Friday, a fellow student meets me there and we walk up to the lecture together (after I get a refill of course). It’s the most peaceful and perfect time of day. I get to quietly sip my drink without any expectations or demands on my time. I can chat with other early risers on Twitter, post stuff to my business page or just watch the world go by. There is a lady that orders a grande (medium sized), triple shot (3 shots of coffee instead of the normal 2), skinny (skimmed milk), wet (no froth on it – crazy as that is the nice bit) latte. I always figure she must really need that coffee. Whilst the skimmed milk might be healthy, I’m not sure the 3 espresso shots don’t cancel that out. People watching with a latte in hand is probably one of my favourite activities and probably one of the only times in my day where I am simply me – not a student, not a therapist, not a mother or wife or responsible adult. It’s just me and my coffee. Hi, my name is Dawn Walton and I am a 44 year old therapist that lives in the Dundee area. I'm originally from Anglesey in North Wales, but I've lived here for 17 years. My first degree was in Computing at UMIST in Manchester. Now I'm studying a Masters in Psychological Research Methods with the aim of going on to do a Phd. I love Starbucks and Pokemon Go. So they are likely to feature in my posts quite often!